‘Twas a cool summer night in July watching one of my favorite movies, “The Holiday” while enjoying popcorn and back massages with my bestie, when I came up with a new breakfast idea for Saturday morning. After falling asleep before the end of the movie we awoke the next morning, powered through a weekend workout at the gym and drooled while the smell of warm cinnamon raisin bread, peanut butter, banana and strawberry (aka heaven on earth) engulfed our nostrils. Two words: Holy. Cow. Plug in Panini Press to warm up. Meanwhile, lay out two pieces of cinnamon swirl bread. Lightly spread Olivio or butter on top of slices, then turn over. Spread peanut butter on both sides. On one piece of bread, evenly place sliced strawberries. Top with pre-sliced frozen banana slices (you can use non-frozen banana but the frozen tastes even better in a panini because it melts and is super gooey and delicious). Sandwich the piece of bread with solely peanut butter on top and place in the panini press for only a few minutes. 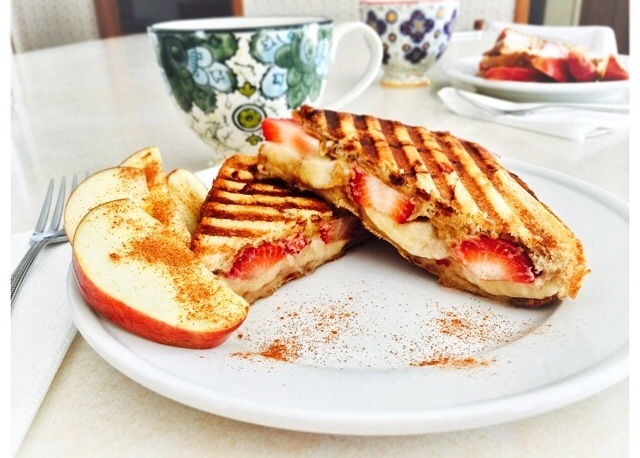 If you are not in love with this panini after the first bite…there is something seriously wrong with you. Bon appétit! Next Post If I eat another one of these pancakes, I think I might flip!